In last March 2012, I wrote a piece about what are the key processes for IT Forensic in Enterprise's environment. Let's do a bit of a recap. 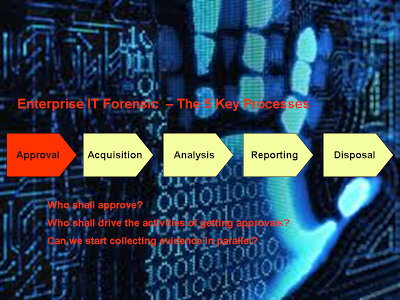 There are 5 key processes - Approval, Acquisition, Analysis, Reporting and Disposal. Today, I'm going to dive into more details on the first process - Approval. Approval is the most important process. We don't want to do something that is illegal right? Therefore, this process will ensure that the investigation and forensic activities are legal in every aspect e.g. company's policy as well as law's. Who shall approve this investigation? c) A person who can confirm that data belonged to the subject (or suspect) is allowed to be transferred and examined by the Investigator e.g. Head of Data Protection. e) In some countries e.g. Germany where the Workers Council is strong, their approval maybe needed as well. Who shall be the driver to gather all these approvals? It is in the best interest of the Requestor for the investigation to be approved. Therefore, the Requestor shall be primarily responsible to gather all the needed approval. The Investigator, to a certain extend (due to resource limitation etc) could provide support as well. Another reason to have the Requestor taking the lead role is to avoid "misuse" of RFI. As an investigator, I'm sure you don't want to be running around chasing for approvals whenever there is a RFI raised to you :) . We know we will get the approval, to expedite the time, could we start collecting evidence in parallel? NO. You shall not do that. Never collect or acquire evidence before you have all the green lights, no matter how strong is the pressure. Just like a police shall never search a place without a warrant. I will say yes, provided that the email is digitally signed with a valid user certificate of your organisation's PKI infrastructure. A digitally signed email will ensure non-repudiation.